The idea of turning your mobile phone into a digital wallet has a long and fruitless history. People are getting excited again about the prospect of mobile wallets replacing those in your pocket overstuffed with receipts and credit cards because both Google and Apple are pursuing the concept. The key technology that could make mobile wallets a reality are near field communication (NFC) chips. Google is already supporting NFC chips in Android phones such as the Nexus S and is expected to roll out tests of wave-and-pay systems at stores in New York City and San Francisco. Apple has been working on putting its own NFC chips in iPhones since at least last summer, although recent reports suggest the technology won’t be ready for the next iPhone 5. There is no doubt that if Apple or Google can make NFC chips in phones a mainstream payment option, it could upend the payments industry and put either of these two technology companies smack in the middle of billions of dollars of commercial transactions. Apple could tie the mobile wallets to people’s iTunes accounts, and Google could tie it to Google Checkout or some other account. But before that happens, there are a few things standing in their way: Local merchants, credit card companies, and consumer behavior. In order for mobile wallets to take off, they not only need to be built into millions of phones (Apple and Google will solve that problem), new NFC-chip readers also need to be installed at millions of retailers so that consumers can wave phones at checkout. These readers cost a few hundred dollars each, and retailers need one per cash register. Local merchants and even national retailers are not going to be jumping at the chance to spend money on this equipment until NFC chips are standard in practically every new mobile phone. Google might need to initially subsidize the NFC readers is it wants merchants to adopt them (Apple probably wouldn’t do that, “subsidize” is not a word in its vocabulary). Once the NFC chips are in both enough handsets and retail registers, then an even bigger hurdle needs to be overcome: consumer behavior. Waving your phone to pay for something is not a natural act. I have an NFC chip in my Chase ATM/Visa card (they call it Blink), and I have never once used it. I would never even think to use it. Waving a card (or phone, for that matter) over a reader is not a huge improvement in ease or convenience to simply swiping a credit card. Credit cards work. More importantly, people know how they work. They are not going to stop swiping and start waving without some incentive to do so. But okay, let’s say that brands start tying rewards with mobile payments and everyone switches over. It is very likely that the merchants will start to become unhappy. Why? 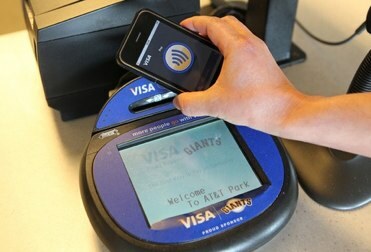 Imagine you are in line at a checkout with your iPhone or Android equipped with an NFC chip for mobile payments. The cashier asks you to tap your phone on the reader. But what are you doing? You are checking your email, sending a Tweet, or checking into Foursquare, and you tell the cashier to hold on a minute. That’s right, you’re holding up the line. In the end, merchants only care about two things: speeding up their checkout lines and cutting costs. Mobile wallets will fail on both those counts. Without getting merchants on board, mobile payments will be a bust. But wait, there’s one more huge obstacle. The credit card companies don’t want to be shoved aside by new payment systems. They will fight tooth and nail against adoption of these technologies or insist that the payments be tied to credit card accounts. But even if your iPhone becomes tied to your Visa account, credit card companies still lose. Right now, their brands are very tangible things that you keep in your wallet and hold in your hands. Their brands are front and center every time you pay with your card. But once they are relegated to the status of an app on your phone, they won’t seem nearly so important. So don’t count the lowly credit card out just yet. More and more, you will probably see deals like the one American Express struck with Foursquare, where the physical swipe of a card triggers special offers and loyalty rewards. All of the benefits of a mobile wallet—loyalty tracking, geo-coupons, group discounts—can just as easily be tied to physical credit cards. And they will be. It’s a good thing NFC chips can be used for other applications besides just payments.